Lila + Hayes of Fort Worth, Texas, is recalling about 600 sets of Eloise and Benton Bubble children’s playwear. The firm has received eight reports of the button detaching from the straps while in use. No injuries have been reported. 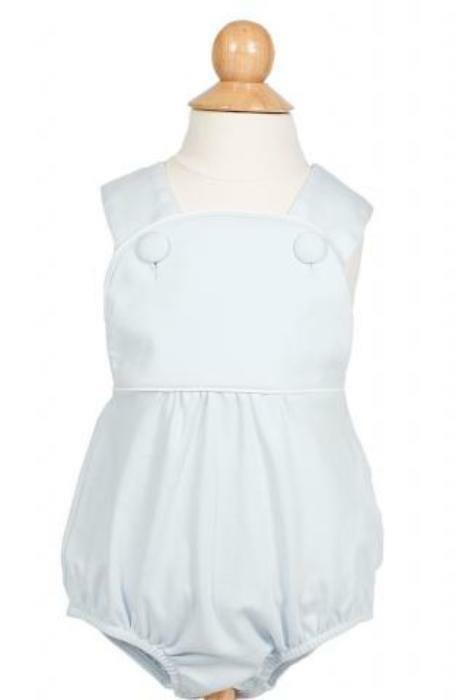 The recall includes Benton and Eloise pima cotton, sleeveless, bubble playwear. The Benton style was sold in navy, white, light blue and blue and green ticking stripes. The Eloise style was sold in navy, white, pink and blue and green floral. The garment has a snap closure at the bottom and crisscross straps that button over the shoulders on the front of the garment. The Benton style was sold in boys sizes NB, 0-24 months, 2T and 3T. The Eloise was sold in girls sizes NB, 0-24 months, 2T and 3T. The manufacture dates codes for December 2016 (DEC16) and February 2016 (FEB16) are printed on the inside garment tag located inside the seam. “Lila + Hayes” and the garment size are printed on the inside of the back of the garment. The garments, manufactured in Peru, were sold at Layette (Dallas, Texas), Hip Hip Hip Hooray (Dallas, Texas) and Born Children's (Montgomery, Alabama) stores and on-line at www.lilaandhayes.com from February 2017 through April 2017 for between $45 and $65. Consumers may contact Lila + Hayes at 855-850-1308 from 10 a.m. to 6 p.m. (CT) Monday through Friday or online at www.lilaandhayes.com and click on “Recall” located at the bottom of the page.